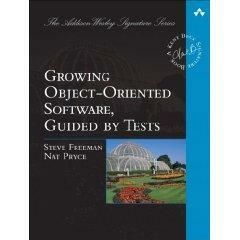 This blog has been quiet for some time while Steve and I knuckled down to finish our book, Growing Object-Oriented Software, Guided by Tests. The book is finally done and is now in the shops (or at least on Amazon... I've not looked for it in a real book shop yet). We've launched a companion website and discussion group for the book and will put the example code from the book online soon. Brian Marick has already translated some of the example code from Java to Ruby. The UK launch of our book will held at the London XP Day conference. As ever, the XP Day programme and keynotes look excellent and I'm looking forward to being there as an audience member. The last few years I missed lots of interesting sessions as I rushed to finish my own presentations. XP Day sells out every year but there are still a few tickets left. If you haven't registered already, do so soon! Hope to see you there. Copyright © 2009 Nat Pryce. Posted 2009-11-10. Share it.